THE RAC has joined forces with Autofirst Network to create the biggest independent garage network in the country. Formed from existing RAC Approved Garage and Autofirst Network members, along with new sign-ups, the newly created RAC Approved Garage Powered By Autofirst Network partnership already has 500 garages on board and is expected to exceed 650 by April this year. As part of the network, each garage will carry the prominent RAC and Autofirst Network joint branding. The partnership, which aims to ensure customers are only a few miles from an RAC Approved Garage, will offer consumers the benefits of a local garage, combined with the trust and confidence associated with the RAC brand. By subscribing, garages will also be offered repair work via the RAC Warranty scheme and have the potential for breakdown repairs from RAC patrols to be referred to them through being part of the company’s Accredited Repairer scheme. In addition, garages can benefit from access to a suite of Euro Car Parts products, including its garage management system, technical training, technical hotline, technician recruitment and support from a dedicated account manager. They will be further supported by a listing on the WhoCanFixMyCar.com website, opening even more opportunities for repair work through its national database. 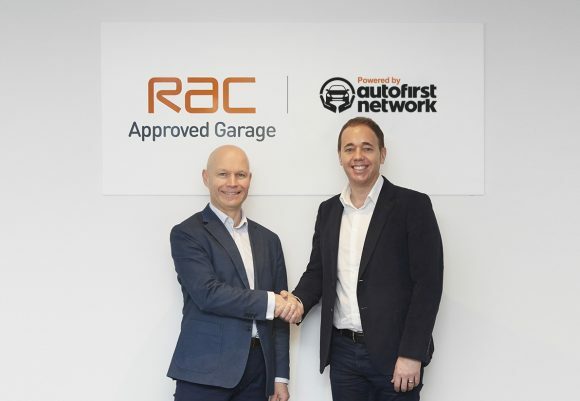 RAC chief executive Dave Hobday, pictured left, said: ‘The RAC name is synonymous with complete peace of mind for motorists, which explains why we have seen so many garages benefit from becoming part of RAC Approved Garage Powered By Autofirst Network. To join, garages will need to offer servicing and repairs and employ qualified professional technicians. They must also be prepared to adhere to the RAC Customer Charter and Code of Conduct approved by the Chartered Trading Standards Institute and agree to a yearly inspection to ensure they meet the agreed standards.